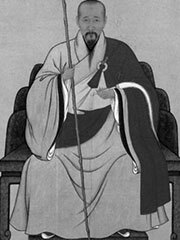 Muyan (Chinese 木庵; pinyin mu yan; Japanese Mokuan Shoto) (1611-1684) was a Chinese Linji Chan monk who followed his master Yinyuan Longqi to Japan in 1654. Together they founded the Ōbaku school and Mampukuji, the school’s head temple at Uji in 1661. In 1664, Muyan succeeded his master as chief of the temple and in 1671 established another temple called Zuishōji at Shirokane, Edo. See also: Japanese Buddhism, Obaku, Zen.